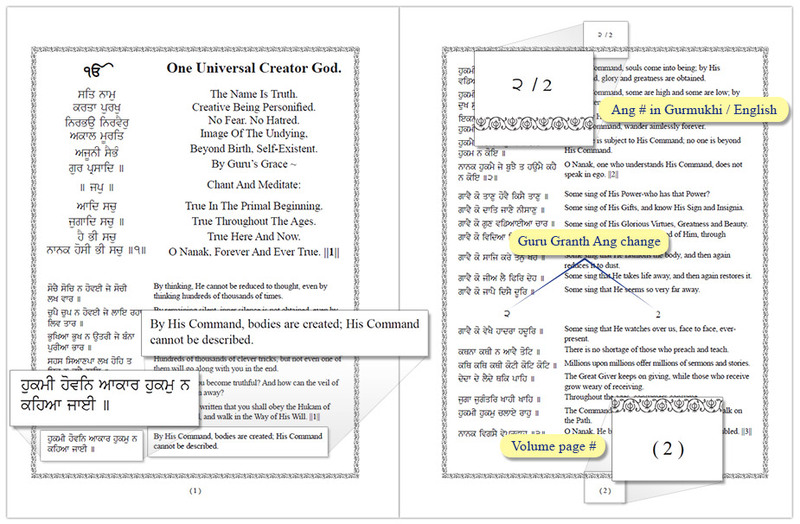 Printing the Dr. Sant Singh Khalsa translation has been long awaited. 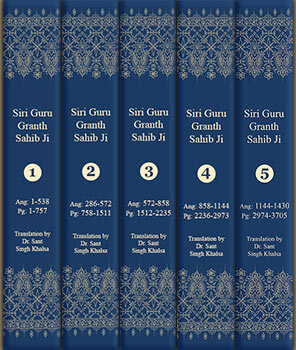 This translation is used online at sites including SikhNet.com, SGPC.net and Sikhitothemax.com. Also, If you have seen Gurbani with translation projected on a screen at your Gurdwara or at Harimander Sahib on the perkarma screens; that is the same same translation as this. We have found it to be easy to read and understand. Some old translations use antiquated English words and Judeo-Christian concepts. Does anybody know what a "mumper" is anyways? 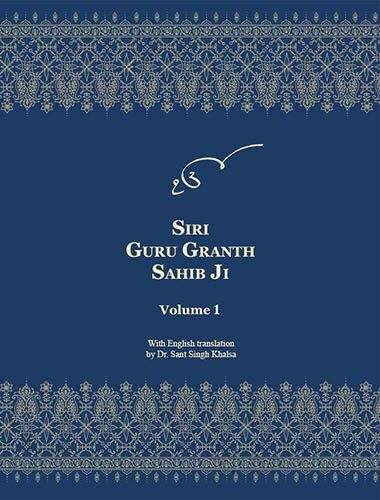 Dr. Sant Singh said, "The translation was based on the 4 available versions comparing and contrasting, and also using a variety of dictionaries, and sometimes using words and translations from the Siri Singh Sahib. It was intended as a consensus translation, using modern English and understandable idioms, and avoiding the antiquated expressions that are so common in the past versions." Read a comparison about the existing English translations. Each of the five volumes must be purchased separately at $49 each. Everything about this 5 volume set, is designed to be EASY TO READ. We used large fonts. We organized each line of Gurbani with it's English translation, so it's easy and intuitive to know exactly what you are reading. This also makes it easy to switch fluidly from English to Gurmukhi and visa versa. These volumes were designed with simplicity and beauty in mind. We hope you enjoy the original patterns on the page borders, and cover. You will notice numbers at the tops and bottoms of each page. 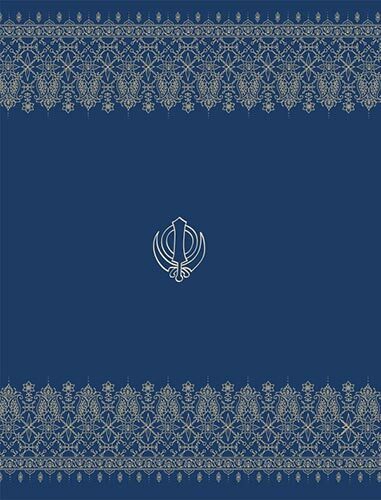 The numbers at the top relate to the proper Gurmukhi Angs of the Siri Guru Granth Sahib. The same number is written in Gurmukhi as well as English. You will notice bold numbers inline where there is a Siri Guru Granth Sahib Ang change. The numbers at the bottom in parenthesis are 'volume page' numbers. 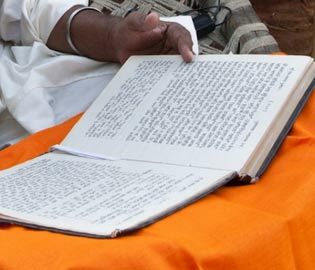 There are about 2.5 volume pages per Ang of the Guru. so you will have to add each volume individually and navigate back. These are high-quality hard cover volumes decorated with original artwork in gold design and printed on high-quality, acid free paper. The set is sold "on-demand" through Lulu.com. That means each volume is only printed when you order it. Although this makes the cost of printing higher, it reduces overall costs, and makes it easier to publish & have available to you online. The quality is far better than similarly published books from India. The printing quality is similar to a full color hard cover college text book. Pages: Each volume has 730-760 pages. The total amount of volume pages for the set is 3,705. "[This] current translation is written in contemporary English, maintaining consistent grammar. The idioms used are those in common usage, and word order reflects the original whenever possible. Repeated words in the original are faithfully repeated in the translation." Read more in a comparison about the existing English translations. Special thanks to Dr. Sant Singh for his hard work on the English translation, and freely giving his permission for this publication; Dr. Kulbir S. Thind for his original effort in organizing and digitizing the Gurbani text; and to the Sikhitothemax sevadars for providing the content in database format which simplified the formatting and saved us months of manual formatting; and to Narinder Singh, who helped with the technical aspect of importing the text into a page layout program, as well as formatting. Click here to read about how to care for these volumes. The printed form of Gurbani it's called Senchi or Pothi. There is a certain respect given to these volumes. If you have any suggestions or find errors in this print edition, please let us know.